Two of the major contenders for the Champions League slots in the Bundesliga met at Borussia-Park on Saturday afternoon. Leverkusen secured 3rd spot with their 6 game winning streak but were without the excellent Julian Brandt who had scored in 5 of those games, Kampl and Bellarabi two other big factors in their excellent form. These absences presented Gladbach an opportunity knowing that a win would put them in 4th position with one matchday to go. What followed was a highly intriguing encounter where both sides showed why they are amongst the upper echelon of the Bundesliga. Gladbach displayed some interesting characteristics in their build-up, right from their use of the goalkeeper Sommer to their intelligent positioning to handicap Leverkusen’s ability to press. Generating a free man in early build-up is rarely ever an issue for Gladbach as they integrate Sommer in their build-up very well. He is constantly used as an out-ball to escape incoming pressure and re-start the build-up when the situation so requires, with his passing ability he can also play over the top of one or more lines of opposition pressure. This is of course a huge asset as it gives them the chance to start an attack in more advanced positions with more space against opponents who attempt to press. With their 3-chain spanning the width of the half spaces in addition to the goalkeeper behind them Gladbach had quite a stable first line from which they could construct attacks. This was particularly the case when considering the interaction between this and the pressing shape of the opponents. Schmidt adapted his preferred 4-2-2-2 pressing scheme with Bayer instead displaying strong asymmetry and creating a situational lop-sided 4-3-3 structure through the contrasting positioning of the nominal wide players. On the right Kruse would join the front line whilst Calhanoglu would drop and act as the left central midfielder. Whilst this positioning could theoretically have prevented Gladbach from creating an overload Bayer did not seem too keen to do so instead they were happy to deflect attacks from their right side towards the left. With this lop-sided positioning from their opponents Gladbach could circulate possession across from Leverkusen’s congested right side towards the left attracting the 2 opposing forwards to the ball in the process before releasing to Elvedi (RCB) the free man. He would then be free to advance with the ball which was partly due to the positioning of the forwards and the subsequent roles of Bayer’s wide midfielders. Initially Bayer pressed fairly aggressively but had some co-ordination issues that allowed the home side to create some dangerous offensive situations. 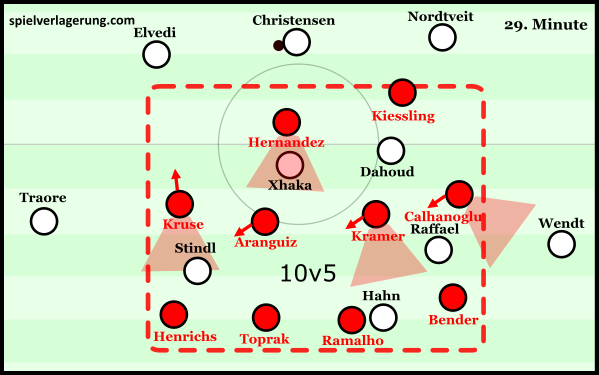 With Aranguiz attempting to press Dahoud in addition to Calhanoglu and Kruse being too high to support the press Kramer is left alone in the centre with the unenviable task of covering Stindl, Raffael and Hahn. Needless to say he couldn’t, and a simple move from Stindl allows him to receive a diagonal pass from Xhaka breaking Bayer’s access in the process. The backline are still trying to re-orient themselves after Ramalho pushes up to prevent Stindl from driving forwards when Stindl splits them apart with a through ball to find Traore. 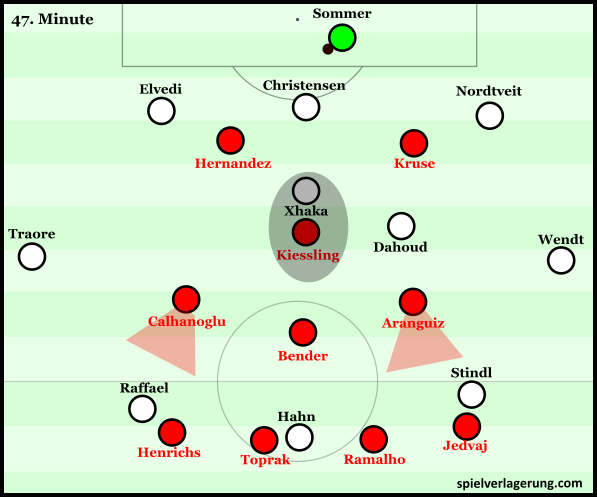 Gladbach’s front 3 were constantly interchanging and roaming between the Leverkusen’s lines of midfield and defence, the roaming was constant to the extent each lacked a defined position. They were, however, fairly constant with their positioning between the lines, whilst one would occupy a position against Leverkusen’s back line the other two forwards were often positioned behind the gap between the opposing wide player and the nearest central midfield player. In this position they attempted to offer diagonal passes to help progress possession. This positioning was key in their attempts to break Leverkusen’s pressing. Leverkusen’s central midfielders understandably struggled to cover these diagonal passing options whilst also covering the centre from the dropping movements of the central forward. They often attempted to use an advancing centre-back to deal with this threat from the central forward with the other 3 defenders narrowing up to close the gap. However Gladbach still managed to create break through and when the centre forward received they used lay offs which allowed Gladbach to exercise their superiority between the lines. Furthermore with the centre back slightly advanced their back line was weakened against the threat of through balls. After these initial issues from which Schubert’s men should have taken the lead Leverkusen’s wide players had to be more cautious in pressing Gladbach’s side backs. This was a good example of effective positioning to cause opponents a major issue. Leverkusen had to choose between pressing the side backs at the risk of the space behind their midfield being exploited or sitting back and waiting patiently for the right moments to press. When Gladbach managed to advance into the 2nd phase of build-up Leverkusen would collectively drop into a base 4-4-2 mid-block defensive shape. Quite surprisingly they played out large parts of these phases in a very position-oriented manner. In a position-oriented zonal system the defensive team have a very clearly defined shape with base positions required to be occupied to make up this shape. One of the main characteristics of the system is it’s passivity as the defensive side will not look to enforce much pressure on the opponents but rather shift and cover to exert great control over the most strategically valuable areas of the field. In this phase Leverkusen were far more stable. They managed to negate the threat of the home side’s three forwards between the lines with their strong use of cover shadows. With the nominal wide players in much deeper positions they could assist the midfield with covering the diagonal passing options allowing them to focus their efforts on covering the centre. In these situations Bayer had very good levels of vertical and horizontal compactness and their optimal distances allowed them to lend support to their team-mates in their defensive actions making them harder to break down collectively. Furthermore their compactness allowed them to create a large defensive overload. With their block consisting of 10 strongly interlinked players Bayer often had a 10v5 numerical advantage within their shape. This went a long way to ensuring they were successful in their goal to exert high levels of control over the space they occupied. 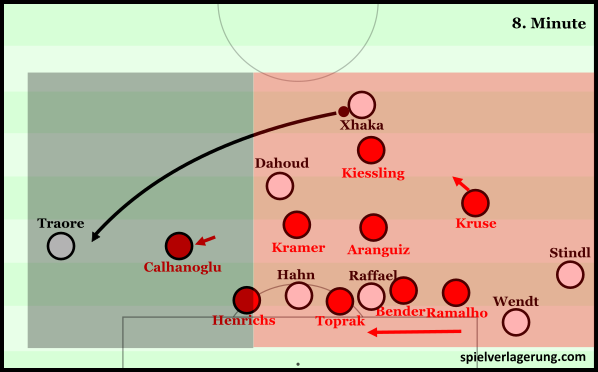 With the strong central covering from Leverkusen causing a heavy underload, Gladbach struggled to penetrate centrally. Despite the rotations between the front three they were constantly well covered and experienced extreme difficulty in evading the opposing cover shadows. In response Gladbach turned to their wing-backs in their attempts to break through the away defence. They used a number of mechanisms to increase the space for them to operate in. One was a simple overload and switch strategy allowing them to create isolations. This was particularly on the right side where they sought to isolate Traore, a player with a skillset that makes him a threat in such situations. To increase the space for Wendt on the left they used a similar concept with slight differences. They would build attacks on the right side partly due to the aformentioned asymmetry in Bayer’s pressing. They then attempted to work the ball across to Wendt by playing through Bayer’s midfield. This was of course extremely difficult with their compactness and they only managed to do so on a couple of occasions but it did create a great chance for them early on. In the scene below Traore’s ability to keep the ball under pressure and in a fairly tight space on the right before finding an intelligent pass to Xhaka on Kramer’s blind-side is crucial in creating the chance. After the interval Leverkusen re-organised their attempts to press. Their initial pressing scheme was too easily beaten which put their defence in compromising situations. However the passivity they showed for large periods harmed their ability to force possession turnovers. With neither of their first half strategies being desirable Schmidt adapted. They now pressed in more of a 4-3-1-2 shape with situational man-orientations on the home side’s deepest midfielder (often Xhaka). Kruse moved up to a right centre forward position alongside Hernandez, while Kiessling maintained coverage of Gladbach’s deepest midfielder behind them. With this new shape they could re-establish their attempts to press with the possibility to create a situational front 3 giving them access across the half spaces. The 3-man midfield line could help them simultaneously cover the diagonal passing options that allowed Schubert’s side to break their press earlier on in the game. This had a variable degree of success as it did allow them better coverage of the half spaces in midfield but a simple dropping movement from Dahoud was enough to break their access on a couple of occasions. Perhaps in response to Leverkusen’s increased access-seeking and situational man-orientations Dahoud and Xhaka started to drift into far wider spaces creating overloads to assist their ball retention in these areas. These movements gave them the chance to either escape the opposing man-orientations or drag them out of position potentially creating space for others in the centre. They also increased the potential for the home side to break through the wide areas with combinations and with Leverkusen often exerting such strong central control this was a necessary alternative. This sporadically had the desired effect with the density in these areas attracting the full-backs forward to press. With diagonal runs towards the flanks they could exploit the space left behind the full-back but these rarely amounted to anything substantial. With the game entering the latter stages and Gladbach becoming more and more desperate for the winner their structures took an interesting turn. Dahoud started advancing and temporarily taking up positions like an attacking midfielder creating temporary 3-1-5-1/3-1-4-2 shapes. 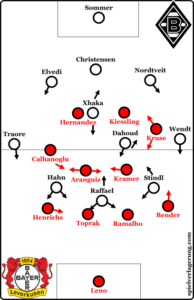 With their centrally-oriented positioning they aimed to overload and force their way through Leverkusen’s territory. With Hazard coming on for Dahoud this switch was confirmed on a more permanent basis. Not long after Hazard’s introduction he played a large part Hahn’s winning goal, receiving on the edge of the box he drove out towards the left before passing to Wendt who cut the ball back across the box. 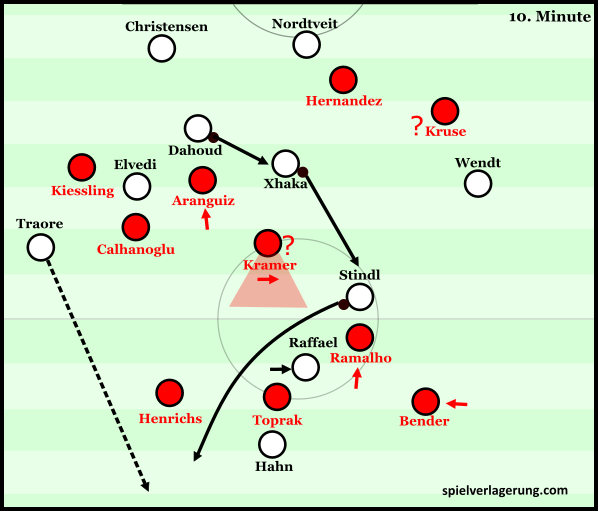 The increased numbers in and around the box played a part in the goal by helping to decrease Leverkusen’s capacity to cover the edge of the box, and giving them the presence to take advantage of the lapse that allowed the ball to reach Hahn near the far post. After the goal Schubert switched back to a 3-4-2-1 to provide numerical cover in the midfield and protect their lead with Stindl dropping into midfield alongside Xhaka, and Hazard joining Raffael and Hahn as the forwards. 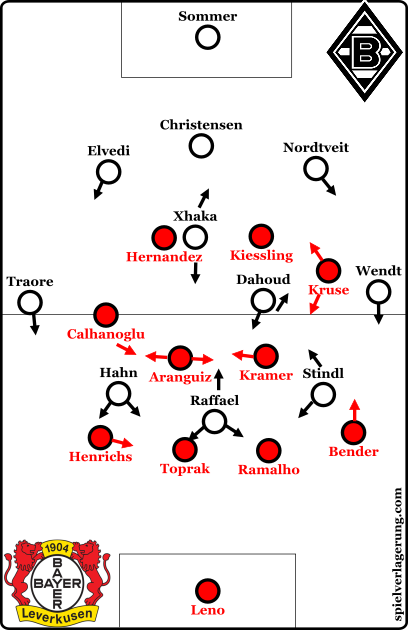 With around 4 minutes of normal time left Stranzl (a centre back) replaced Raffael as the home side moved to a base 4-4-2 shape in defence with Nordtveit moving into a holding midfield position. Wendt-LB, Elvedi-RB. The time Schubert wasted with his substitutions may have assisted as much as the shape-shifting in ensuring the home side saw out the game and were victorious. This was a thrilling game and credit must go to both managers who demonstrated pro-active management in creating effective game plans and adapting in-game to alter the course of events. This victory all but confirms that Gladbach will be playing Champions league football (qualifiers) again next season. Credit must be given to the manager Andre Schubert who came in faced with the club in dire straights before turning their campaign around with some of the best form in the Bundesliga. They now need to ensure the likes of Dahoud remain with the club as they embark on another Champions League campaign. Leverkusen’s season was technically over before the game with no chance of moving either up or down in the table. When combined with the absence of Brandt, Bellarabi and Kampl. With the fantastic additions of Kramer and Aranguiz having a year to settle and the likes of Brandt and Jedvaj a year further on in their development Leverkusen could well challenge for honours next season. Awesome as always! Shame the videos can’t be displayed though.